cheap generic viagra mail order pharmacy Three years ago, on a trip to Philadelphia, Steve Wyland got hooked on the thrill of axe throwing. An old friend took him to an indoor axe throwing facility, and as he looked around at the crowd there and saw men and women of all ages enjoying the off-the-beaten-path activity, he saw a future for a similar concept in San Diego. buy now In April, Wyland opened Battle Axe — the city’s first indoor axe throwing center. visit website “Yes, a lot of people laugh and it’s hard but it’s a fun activity … it’s adrenaline,” he said, likening the experience to going to gun range but with less expense. Axe throwing centers are relatively new to the West Coast, but the sport itself has been popular in areas where logging is a main industry. However, it is unclear on where exactly commercial axe throwing officially began. “There’s a lot of [axe throwing businesses] in Canada, so that would be my guess,” Wyland said. 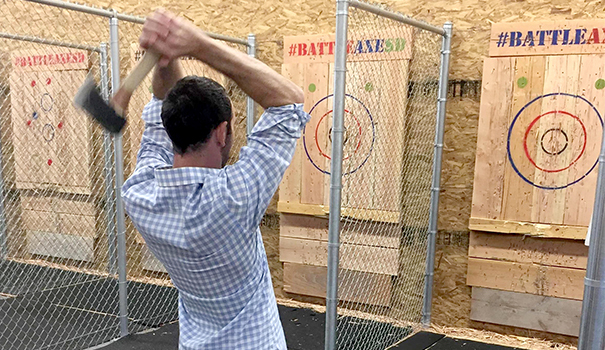 Battle Axe, located at 6330 Riverdale St. in Grantville, is the first of several similar axe-throwing businesses that have popped up around San Diego this year, including Downtown, Uptown, Pacific Beach and San Marcos. To separate his shop from the others in this fast-growing recreational business, Wyland designed Battle Axe to be a clean and fun gym experience, rather than a hokey barn-like atmosphere. 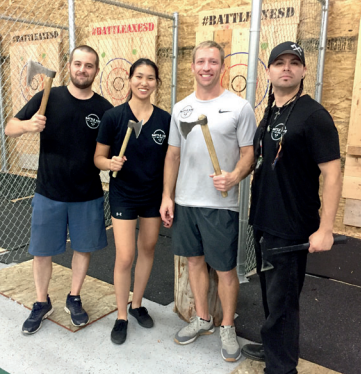 One of the “axe-perts” at Battle Axe is Jeff Steinbacher, who has been throwing axes — and pretty much anything else that is sharp and sticks into a target — for over 10 years. Steinbacher — who holds a world record for speed throwing knives (an impressive 30 knives in 20 seconds) — is a member of the San Diego Chuckers, a local team that competes in throwing competitions at a national level. In October, the team will compete at the final event for throwing held in Austin, Texas. “Next year I hope to go to Europe,” he said. Even though axe throwing centers are gaining popularity, Steinbacher said competitive throwing uses different tools. 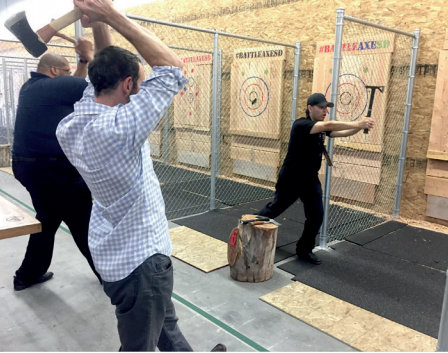 One of those people that loved it is Robrigo Cano, who recently threw axes for his first time as part of a corporate outing with Kaiser Permanente. “It is a lot of fun, very exciting,” he said, adding that he would gladly come back again. This kind of response is what Wyland is banking on — attracting groups like fraternities from nearby SDSU and more corporate events, as well as just individuals interested in improving their throwing skills. Battle Axe will also soon start hosting league play, starting with a Sunday cash league. Wyland is also looking to offer a mobile axe throw by installing a target at the end of a cargo truck so he can bring the sport to parties, breweries, etc. However, so far, he has been unable to find insurance for the venture. In the meantime, Wyland is concentrating on getting the word out about axe throwing and get more people to “come with an open mind and have fun” at Battle Axe. “When people walk in, they go, ‘this is awesome,’ just by the look of it. And then when they leave, they say, ‘that was awesome.’ Honestly, that is my goal,” he said.